Dinner parties should be underwhelming and fun and this salad is definitely those two things. It has the simplest combination of ingredients that go so very well together. 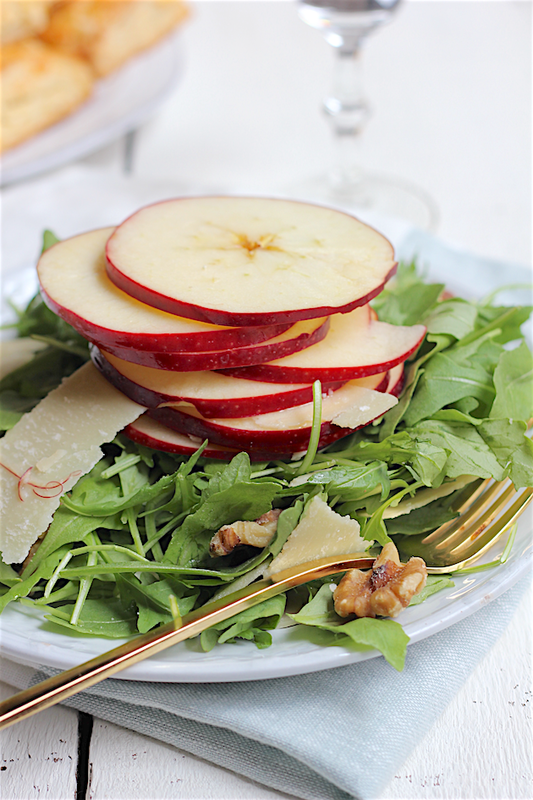 The crunch and freshness of the apples pair incredibly well the creaminess of the cheese. 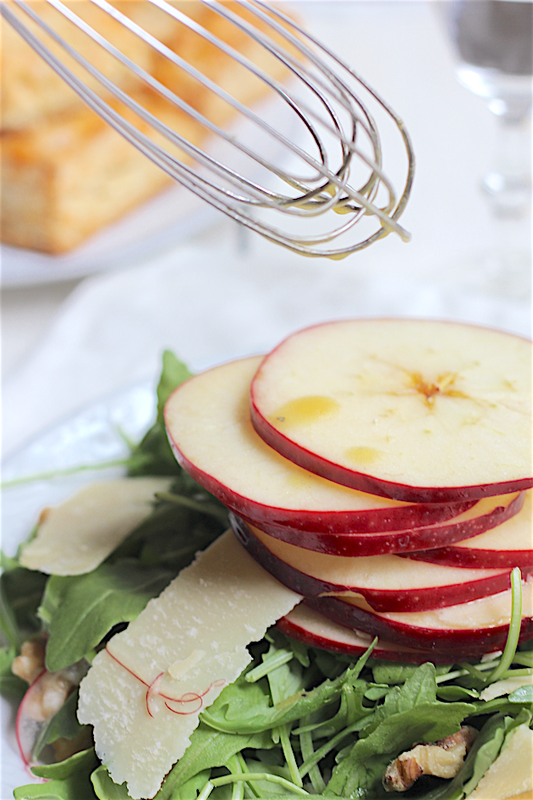 The amazing apple cider vinaigrette is really what brings it all together. It's homemade, takes 2 seconds to make, and it's sweet and tart all in one. And isn't the salad pretty??!! I served it with some homemade cheddar biscuits that I will tell you all about soon, so stay tuned! 1. Add all of the ingredients for the dressing into a small bowl. Whisk until thoroughly combined. Set aside. 2. Use a sharp knife or a mandolin (I used this one) to cut the apples into 1/8in slices. Squeeze some lemon juice over the tops and bottoms of each slice to keep it from turning brown. The lemon juice also adds great flavor, too! Place a handful of arugula on to each plate. 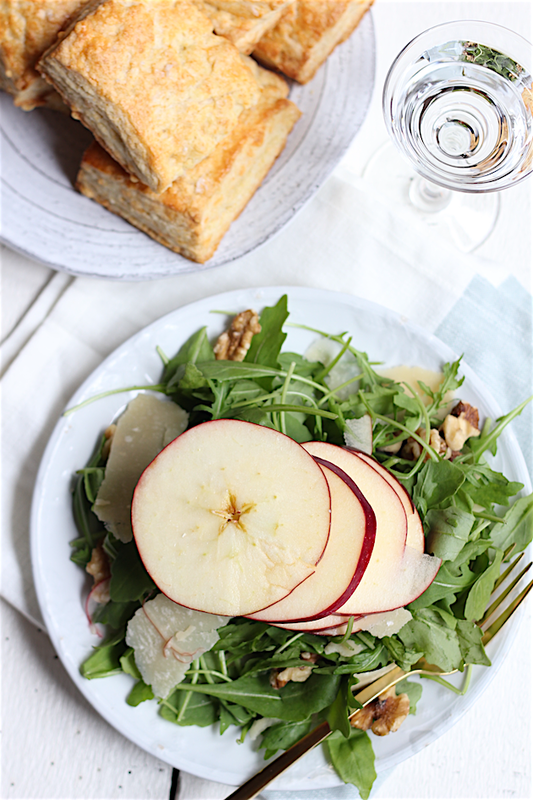 Stack a few slices of apple on the middle of the salad. Sprinkle the salad with shaved Parmesan cheese and a few walnuts. Pour a few spoonfuls of dressing right over the top. I have followed your blog for so long and always thoroughly enjoy it.